Have you heard the news? Burger King just came out with a delicious twist on one of America’s classic breakfast cereals. The Lucky Charms Shake has velvety vanilla ice cream and Lucky Charms oat cereal with marshmallows, hand spun to perfection. This new milk shake is out of this world and lucky for you, with today’s secret recipe you can enjoy this sweet treat at home. In a blender combine vanilla ice cream, milk, and marshmallow cream in a blender. Blend for about 60 seconds, then toss in the cereal and then pulse the mixture once or twice to just blend the cereal. Top with whipped cream if desired. You may want to top with a few of the marshmallows. One of the ways that Burger King sets itself apart from the competition is the crispy onion rings. Many other burger restaurants only have French fries on the menu. I love how the Burger King onion rings are made with minced onions as opposed to an actual ring of onion. With today’s secret recipe, you can recreate these tasty rings at home. Mix the minced onions with half the breadcrumbs and about 2 tablespoons of milk. Take about 2 tablespoons of the mixture and shape into a small ring on a foil-lined cookie sheet. Repeat until you have used all of the mixture. Place the cookie sheet with the rings in the freezer for at least an hour. 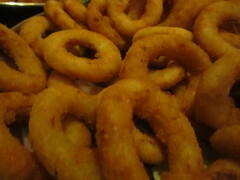 When ready to cook the onion rings, heat oil to 350 degrees F.
Take the rings out of the freezer and set aside. In a medium bowl, mix garlic powder in with the remaining breadcrumbs. In another medium bowl, mix together flour and enough milk to get a nice paste. Dip an onion into the milk and flour mixture. Then dip into into the breadcrumbs. Fry a handful of the rings at a time for 1 1/2 to 3 minutes or until golden brown. Remove rings from the oil onto a rack or paper towels to drain. Repeat until all are cooked. Lightly salt them and serve them immediately. I love Burger King’s hot and crispy French fries. These signature fries are golden on the outside and fluffy on the inside. 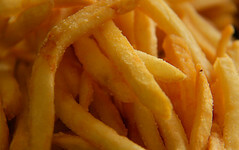 We all know that fries always taste best when they are fresh out of the fryer. When I came across this secret recipe for Burger King’s French Fries, I knew I had to share it with you. You’ll never buy another bag of those frozen fries at the supermarket again once you see how easy it is to make the King’s fries at home. Place in bowl of very cold water: keep rinsing and changing the water until the water is clear; drain thoroughly and dry with paper towels or a clean lintless kitchen towel. Meanwhile, you preheat your hot oil to 350 degrees F.
Place prepared taters in oil and cook about 5 minutes. They will have that blond-tone color to them. NOTE: Once you add cold potatoes to the hot oil, the temperature of your oil is going to drop – you want it to be somewhere between 330 – 325 degrees F.
Remove from oil; drain and cool. Now – either refrigerate until ready to finish cooking, or cool completely and freeze up to 3 months. To freeze properly – place completely cooled fries in single layer on tray and place in freezer until frozen. THEN bag them. To finish cooking – preheat your oil to 400* F. Add your cold fries (which will drop the oil temp – which is fine because you want it near the 375 degrees F. temp) and cook a few minutes until done. Lightly salt them and shake well so that the salt distributes well and they are not salty. Today I have two secret recipes that will allow you to recreate one of Burger King’s fresh new salads. Their new chicken, apple and cranberry garden fresh salad combines the perfect blend of lettuce, grilled chicken, crisp apples, sweet dried cranberries and crumbly blue cheese. At BK they serve this salad with a delicious apple cider vinaigrette and you can make this salad dressing using the secret recipe below. Add ingredients to a small mixing bowl. Mix well. Stop wasting all your hard work by eating all the Wrong Foods. 3) Save Thousands Of Dollars On Hotel Travel!